Come and discover our Bed and Breakfasts! Olivier and Armelle de La Blanchardière take good care of their family property, particularly of their bed and breakfasts where calm, comfort and authenticity are keywords. There you will sleep in beautiful embroidered linen, like in noble dwellings of old. Some of the bedrooms may be rented as suites for families. Bedrooms offer a view on the park or the sea, depending on their position. You will savour copious breakfasts in the dining room or in the park when it's sunny, with various home-made foods from Armelle's kitchen. Arrivals between 4 and 7 pm. For your meals, 4 restaurants are within reach by foot through the park or the coastal path. 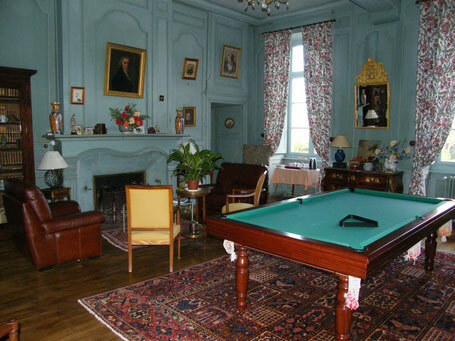 For relaxing moments, our hosts may enjoy the living-room with its pool table.... A nice crackling fire may invite you to curl in a comfortable armchair with one of the books at your disposal, unless you chose to start a board game in family. You will find wood old games in the same room. If it's sunny, you may savour this first meal on small tables outdoors... with a splendid view on the park and the sea ! For your meals, 4 restaurants are within reach by foot through the park or the coastal path, and numerous other places close by to whom we can book a table for you if you wish.